Rocky Crest Resort offers a few dining choices: Our golf course is complimented by an impressive, beautifully appointed, log clubhouse set atop a giant rock platform overlooking the 18th green. 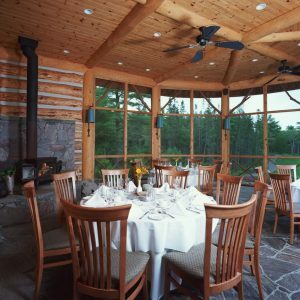 This building has 3 dining options, outdoor patio, inside main dining room, and a private dining gazebo for up to 30 guests. Offering postcard views of Hamer Bay, our main dining room “Windows” is one of Muskoka’s finest venues. With a focus on your classic steakhouse menu, our Canadiana menu brings to life a wide selection of regional favourites in a traditional Muskoka setting.